Select the text on the slide that you want to add to a list. 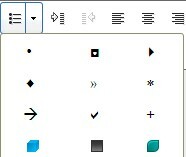 Click the Add Bullets or Change Bullet Style icon or the Add Numbering or Change Numbering Style icon on the toolbar. 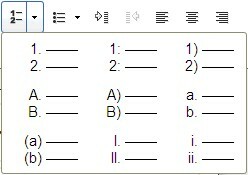 The default bullet or numbering style is applied to your list items. To choose a different bullet or numbering style, select the text, click the down arrow in the appropriate icon, and click the style that you want.